The local hospital was also heavily shelled, with patients and personnel still inside the building. Local resident Irina told RT on the phone of unconfirmed reports that a surgeon was killed. Irina and Roman said that a local school was also shelled, but there is no official confirmation so far. There are no official figures of the killed and injured so far. A video of the damaged hospital was posted on YouTube. The army has been detaining people, local resident Irina, who was fleeing to Kharkov, told RT on the phone. Residents told RT that the Ukrainian National Guard is raiding apartments in Krasny Liman looking for self-defense forces. The village is located about 20 kilometers north of Slavyansk and has a population of about 23,000 people. Witnesses told RIA Novosti that the Ukrainian army scattered leaflets over the city from a helicopter, calling on the self-defense forces to surrender. “All who lay down their arms and surrender voluntarily are guaranteed life and fair justice," the leaflet reportedly read, adding that that those who don’t would be killed. The Ukrainian army is carrying out a military operation in the Donetsk and Lugansk regions, which proclaimed themselves independent from Kiev following referendums in May. On Tuesday, the National Guard launched a massive artillery attack on Slavyansk, a city with a population of over 110,000 people, and its suburbs at 6 am local time. The fighting, which has been ongoing all day is “the longest fight that has happened during the entire standoff in Ukraine,” said the press secretary of the People’s Mayor of Slavyansk, Stella Khorosheva, Itar-Tass reported. 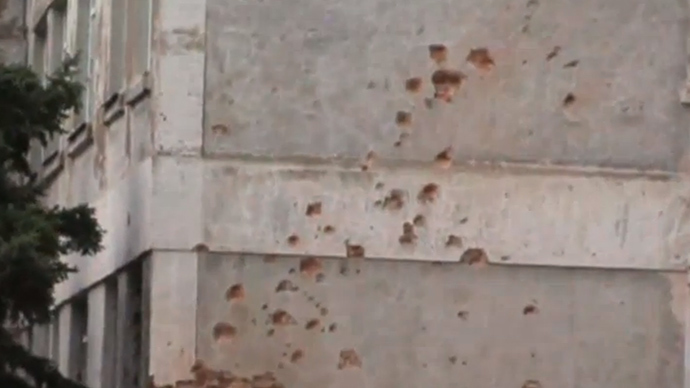 Ukrainian Air Force fighter jets fired missiles at the villages of Semenovka and Cherevkovka near the city on Tuesday, the People’s Mayor of Slavyansk, Vyacheslav Ponomarev, told Itar-Tass. At least five missile strikes were carried out on Semenovka, the news agency reported, citing self-defense forces. The Ukrainian troops brought to Slavyansk up to 100 units of military equipment, including tanks, self-propelled artillery and Tulpan mortars, self-propelled Gvozdika howitzers and Grad multiple launch rocket systems, Khorosheva said earlier Tuesday. 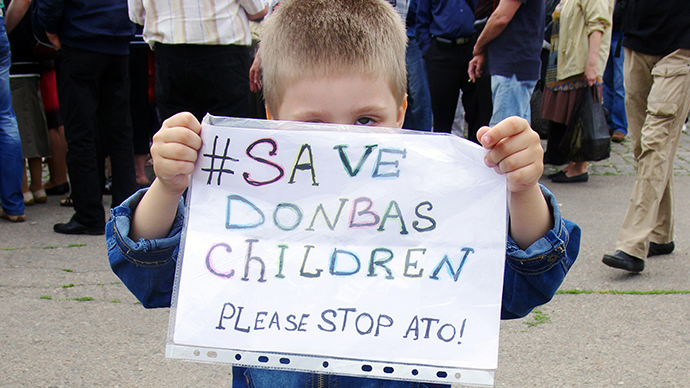 The civilian population in Slavyansk is hiding from the constant shelling in basements. Over 300 self-defense fighters have been killed over the course of Kiev’s military operation in eastern Ukraine, said the Ukrainian army’s head of the operational group reporting on the military crackdown, Vladimir Seleznev, earlier Tuesday. On Monday, the Ukrainian Air Force showered the outskirts of the eastern city of Lugansk with dozens of missiles. 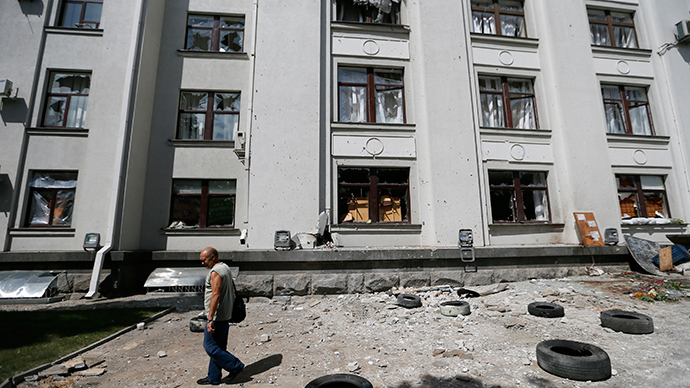 Kiev said Tuesday that its helicopters and jets “fired more than 150 missiles” on Lugansk and its suburbs. 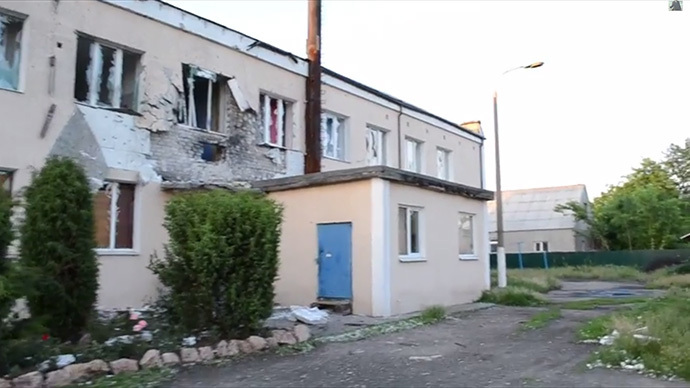 A Ukrainian missile also hit the administration building in the very heart of the city, as confirmed by the OSCE, killing at least eight civilians inside and near the building. Kiev’s punitive operation of the eastern regions of Donetsk and Lugansk has been ongoing since April. The military crackdown was launched following a mass uprising against the coup-appointed government, as the regions demanded broader independence from Kiev. After the presidential elections on May 25, the new president-elect, chocolate billionaire Petro Poroshenko, announced that the military operation would continue, demanding: “It must be more effective, and military units must be better equipped." 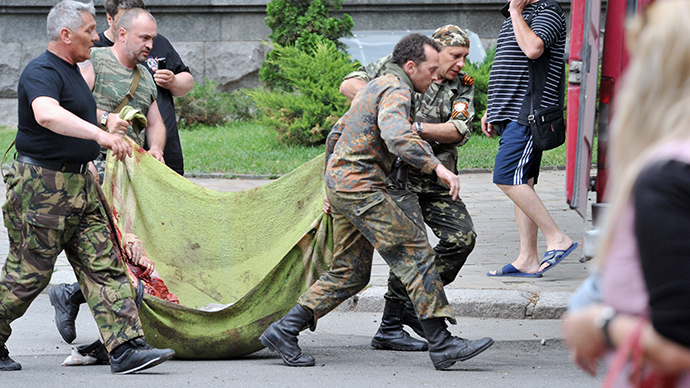 A total of 181 people have been killed, including 59 of the ruling regime’s troops, and 293 have been injured, said the country’s Prosecutor General, Oleg Makhnitsky, during a press conference Tuesday. He added that over 220 people have been abducted, including 12 foreign citizens, since the anti-Kiev uprising started in the Lugansk and Donetsk regions.